Heads of the nation’s security agencies have expressed worry over alleged ongoing attempts by some groups to disrupt the processes leading to the 2019 general elections. The Senior Special Assistant to the President on Media and Publicity, Garba Shehu, disclosed this in a statement made available to journalists in Abuja on Thursday. 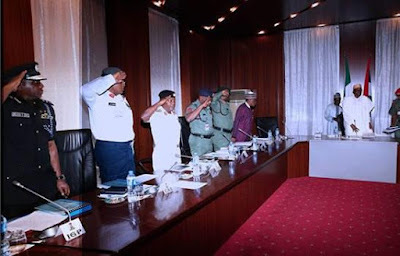 Shehu said the heads of the security agencies expressed the worry during an interactive session they had with some media owners and senior journalists at the Presidential Villa, Abuja on Tuesday. The presidential spokesman listed those who addressed the media practitioners to include the Director General of the Department of State Services, Lawal Daura; Director General of the National Intelligence Agency, Ambassador Ahmed Abubakar; and the Chief of Defence Staff, Gen. Gabriel Olonisakin. He quoted them as saying that the aim of the unnamed groups was to create a stalemate in the polity. He said, “The security chieftains expressed the particular worry that there are groups in the country with evil designs to disrupt the processes leading to the 2019 general elections in the hope of creating a stalemate. “They warned the media against the activities of some unregistered groups that have lately been active in trying to undermine critical institutions such as the law-enforcement agencies and the Independent National Electoral Commission. Shehu said in the midst of the debate over the right to freedom of expression and the government’s efforts to ensure that the digital space and the mass media generally did not become a playground for terrorism and destabilisation, the security chiefs gave assurances that they would maintain a balance between openness and national security. He said they however called on media owners and journalists to walk the fine balance between openness on one hand and national security on the other. According to him, the security chiefs also gave assurances that the security situation in the country was within the control of the government. He further quoted them as saying that the situation could be helped where the media reduce sensation from their daily coverage. “Our state of national security is not as bad as it is painted by the media,” he quoted them as saying. In seeking the support from the media towards the achievement of security for everyone, the heads of the agencies reportedly emphasised that sharing and coordination among security agencies and the media were essential to counter the ever-changing threats faced by the nation. Shehu further said the security chiefs also expressed the view that the Nigerian media had a role to play in securing Nigeria’s national interest. This expected role of the press, he said, was in tandem with global best practices, particularly on issues that had bearing on national security. He said the security chiefs, therefore, invited the media “as partners to continue to be security conscious and exercise restraint in disseminating information that could expose the services to ridicule or harm our national security.